The programme includes the premier of Winstan Whitter's new documentary film "Save our Heritage"(some of you may have seen his brilliant film "A legacy in the dust"). The writer Iain Sinclair will describe his strange experience of being banned from Hackney Council's libraries and he will be reading from his forthcoming book "Hackney. That rose-red empire". There will be performances of poetry by Dalston's very own Michael Rosen childrens' laureate, writer and broadcaster. Followers of OPEN's campaign in Dalston will recall that, on appealing to the Secretary of State to call in the authorities plans for the demolition and redevelopment of Dalston, we received the reply that "the proposed transport interchange between the East London line northern extension, the North London Line and London Buses, is an essential part of the transport improvements required for the London Olympics 2012." Barratt's development of 10 to 20 storey residential towers on Hackney Council's Dalston Lane (South) site. Only 28 flats will be for social housing. 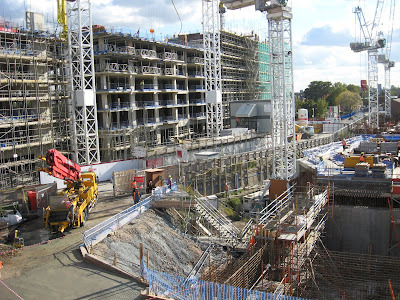 These photos are of the Dalston transport interchange now under construction and the towerblocks with 550 flats and shops being built for sale to pay for it. 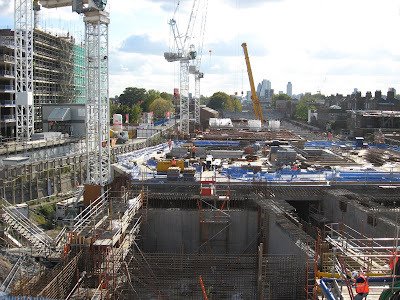 TfL's £39 million concrete slab development for a bus turnaround above the Dalston Junction East London Line station where Barratt's are to build further residential towers of up to 20 storeys for private sale. The evening will conclude with information about the authorities plans for the demolition and redevelopment of over 20 more buildings in Dalston and a discussion about our Olympic legacy. Hackney's Olympic legacy was dealt a further blow last week after officials refused to rule out moving the media centre for the 2012 Olympic Games to Stratford, Newham. I've heard that Dalston's £39 million Olympic Bus Station has turned into a white elephant. Instead of 12 bus stands on the concrete slab, costing £3.4million each, now there will only be one(@ £39 million). And that Barratt can't afford to build all the flats now so there's no way Hackney will get our money back from the sales. More congratulations due to Jules Pipeshaft. Was anyone recording the event? The event was filmed and we hope to publish a link to it shortly. Also Winstan Whittar's film "Save our heritage" will be available as a cd at an affordable price. We'll put further details of this on the blog. Here is a video from the event, from http://visionon.tv project. If you whont an embed for the blog send us a mail. It seems to me we should be calling the Dalston development "Pipe's Folly"